Milner's book, published by Barrington Stoke, follows a young boy as he and his mother set out from their home to find somewhere safe to live. For the first time in the Klaus Flugge Prize’s three year history, the judges chose to award a Highly Commended certificate, which went to Victoria Semykina for her book The Real Boat (Templar). Awarding Kate with her prize, Lauren Child highlighted the collaborative nature of picture book creation and the work of editors, art directors and designers in the creation of successful picture books. A picture book is a collective work, she said. Julia Eccleshare, chair of the judges, pointed to the success of former winners, Nicholas John Frith and 2017 winner Francesca Sanna. Frith has published two more picture books since winning in 2016; Sanna’s new book Me and My Fear, is published this month. It was revealed at the ceremony that Barrington Stoke has signed Milner’s new book, provisionally entitled Lucky and the Food Bank. 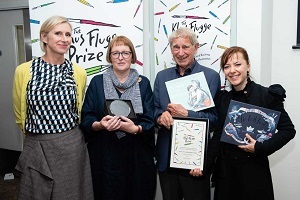 Alongside Ecclesshare and Child, the judges were Goldy Broad, Charlotte Colwill, of Foyles bookshop and 2017 Klaus Flugge Prize winner Francesca Sanna. Pictured (l-r): Lauren Child, Kate Milner, Klaus Flugge and Victoria Semykina.